On Dancing With The Stars, we've learned that sometimes the least coordinated human can learn to dance. Save folks like Wynonna Judd who was recently voted off the current season, others like Donnie Osmond and Kirstie Alley (not known for being able to 'shake their tail feathers') proved not only able to excel quickly, but in some cases win the competition. But what about the animal kingdom- do they also have the moves? In a tongue-and-cheek post I wrote recently, titled, "Can Luna The Polar Bear Learn The Harlem Shake?" I suggested the Buffalo Zoo teach their star polar bear cub 'Luna' to learn the latest dance craze so as to aid in their fund-raising efforts. To which I was told by the Zoo's PR department: "it's just not possible to train a bear to dance." While perhaps true, such is not the case for a sea lion residing at the UC Santa Cruz's Long Marine Laboratory. Supposedly the first non-human mammal to keep a beat, the female lion known as 'Ronan' has displayed what is called "rhythmic entrainment," or the ability to sync movements to a musical beat. According to graduate student Peter Cook, "this is kind of a new frontier." With this research underway, there's a new belief that rhythmic movements amongst animals are much more wide-spread in the animal kingdom than originally thought. Cook said extensive testing under many conditions Peter Cook showed repeatedly that Ronan's head movements were not mimicry or a trained behavior. Now working with UC Santa Cruz associate professor of psychology Margaret Wilson, Cook hopes to uncover the implications of Ronan's abilities. "We're thinking about other animals you could do this with," he said. UC Santa Cruz spokesman Guy Lasnier said Ronan's ability to move to the music was initially interpreted as an April Fools joke when news of the study broke on that day. But in fact, the possibility of different animals moving to the beat has been studied in the burgeoning psychological field for years, and "Ronan has been training for months and observed for more than a year for her beat-keeping skills," Lasnier said. So, I go back to my opening supposition. 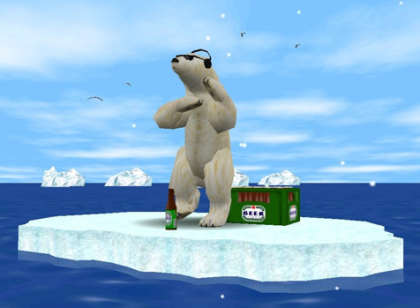 If Ronan can learn to boogie to Earth, Wind & Fire's "Boogie Nights," why can't Luna the polar bear follow suit? After all, the Harlem Shake takes a lot less finesse and even humans with two left feet have been able to shake one out when prompted? Your call Buffalo Zoo? Cannibal Rats on a Ghost Ship! The Horror Animal Video of the Day!! !